Mid A 15 wrote: Mr Carrington really did a tremendous job getting a team together, looking back, when you consider that Athletics was never really regarded as a mainstream sport during our time at CH. For example I was categorically told that cricket came first which, as it happened, was my preference but given that fact one imagines that some decent athletes probably never competed for the school. Up to 1961 as far as I know there was no athletics team nor competition. There was compulsory athletics "standards" where you had to compete in every event and got points for your house by beating certain markers (time for running, height / distance for jumping etc.) There was absolutely no training, advice or responsible supervision etc and my shoulder has finally failed as a result of throwing the shot discus style - yes, I did get the points so Kit was pleased. Another favourite was to put hurdles back-to-front so that they wouldn't come off and you fell into the cinders which then got under the skin and hurt like h*** when you had to start again immediately. Failure to get points was a beatable offence - I won't embarrass them by naming the two in Col A whom I know were so punished for eurovision type scores. Finally there was the Sports Day when house teams seemed to have been chosen by lot. In Col A athletics was so hated that nobody bothered to compete - you just went out there and jogged round the track as necessary. There was a sailing team, surprisingly; about 2 matches a summer over near Guildford. Yes, cricket was THE summer boredom though I think that there might have been a lonely tennis court somewhere if you could get out of compulsory cricket. Apart from that there was prep, Eton Fives, prep, swimming, prep, fishing and prep. If there was no Athletics team in your time David I suspect Mr Carrington singlehandedly created it although I do remember Mr Read (see Maine photos thread) taking an interest in Athletics. Nr Carrington definitely had some interest in athletics during my time. Forgive a first-time poster's infelicities, but I may be able to fill in a few missing names from the photos. Ian Harris, Olly Stones, ?, ?, Ian Mackay, Keith Workman, Buster Howes, ? Phil Naylor. Apologies (a) to those I have left out and (b) to those I have inevitably mis-identified. sejintenej wrote: I don't recall a Mr Carrington. Tall man, I seem to remember him walking with a bit of a stoop as he was so tall and spent a lot of time bending to speak. JM Carrington - he was a housemaster I think. Thornton A, perhaps? elbe wrote: Forgive a first-time poster's infelicities, but I may be able to fill in a few missing names from the photos. Well done Leslie, you've remembered the names very well. I've added a couple that I (think I) remember. Thanks for posting these pictures, Bob. They bring back good memories. In the 1973 photo, the front row line-up is (l-r): Bill Olver, Jo Bryant, Grant Keir, Duncan McCallum, Mark Coleman, Stuart Pryle, Ian Weatherhill, Andrew Ashe, Nigel Harrison. 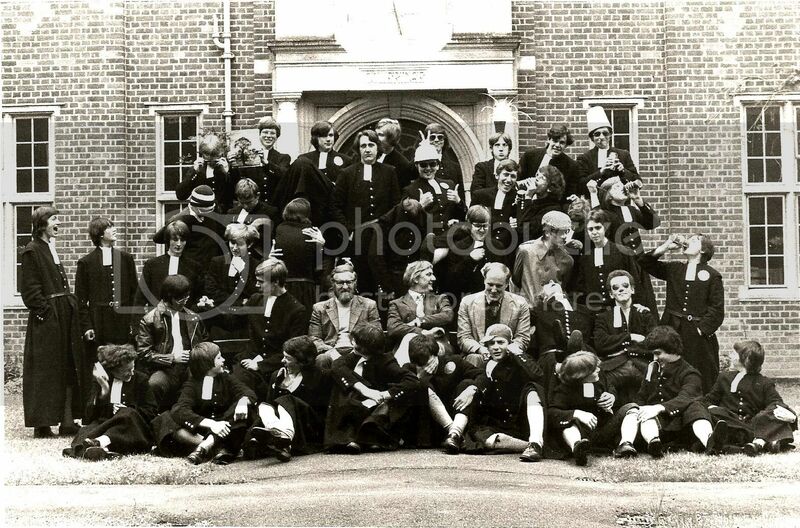 In the 1974 photo, front row is Peter Boys, Mark Wyatt, Mike Mitchell, Clive Thompson, Simon Gillespie, Les Blohm, Martin Garner, Peter Hiett. I still find it strange that in the space of a few years, Christian names became known for all. I only knew the names of my closest 'mates' in house. Maybe the more 'military' regime ended at the demise of the C.M.E. Seaman era. Karl Thompson wrote: In the 1973 photo, the front row line-up is (l-r): Bill Olver, Jo Bryant, Grant Keir, Duncan McCallum, Mark Coleman, Stuart Pryle, Ian Weatherhill, Andrew Ashe, Nigel Harrison. 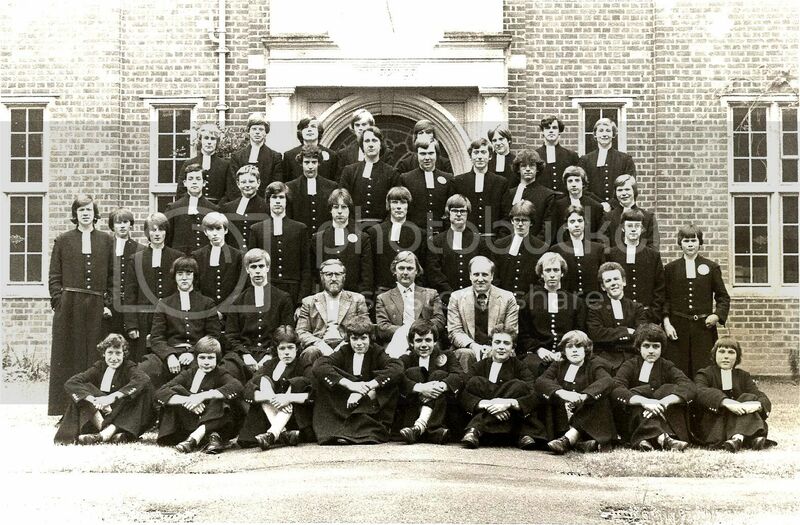 In the 1974 photo, front row is Peter Boys, Mark Wyatt, Mike Mitchell, Clive Thompson, Simon Gillespie, Les Blohm, Martin Garner, Peter Hiett. Well remembered Karl - what house were you in? bluegrunt wrote: Well remembered Karl - what house were you in? I was in a sort of Wendy house, mate. Bottom row: Iain Harris, Oliver Stones, Ben Sweeney, Ian McKay, Keith Worker, Francis Howes, Simon Chevill, Philip Naylor. FINAL PARAGRAPH REMOVED BY MODERATORS. INAPPROPRIATE COMMENT ! Summer 1978. Sensible house photo and daft house photo. The original prints were very low-contrast so I've tweaked them darker and now they just look ancient instead. 5th row James Maxwell, Nick Mainwaring, Nick Cullen, James Keeley, Simon Horne, Chris Mitchell, Edward Sturdy, Kevin Parker, Trevor Bridgman. In the silly photo, note the magnificently surly Melvyn Batt in second row, resolutely refusing to join in with the spirit of the thing. He had just been forcibly transferred from Middleton B to Coleridge A in the vain hope that the experience would prove character-moulding. It didn't. And why in hell would it when his old chums in Middleton B were just ten steps away across the side asphalt? Now I knew Neil Simms (quite well) and Peter Brotherton (less well), but I wouldn't have recognized either of them. And this Trappes-Lomax guy looks just like James Naughtie. michael scuffil wrote: Now I knew Neil Simms (quite well) and Peter Brotherton (less well), but I wouldn't have recognized either of them. And this Trappes-Lomax guy looks just like James Naughtie. I could NEVER expect N.T. (Bogey) Fryer to have allowed such a photo to be taken during his tenure at Coleridge B ! !